About 120 thousand people have gathered around the young people who are carrying out a hunger strike against "brainwashing" imposed by Beijing on schools. Also, the great democrat Martin Lee Chu-ming. Protests held abroad. Hong Kong (AsiaNews) - Cardinal Joseph Zen and the entrepreneur Jimmy Lai were among the most prominent figures to have participated in huge demonstration yesterday evening calling for the cancellation of a program for "national education" (or "patriotic") in Hong Kong's schools. 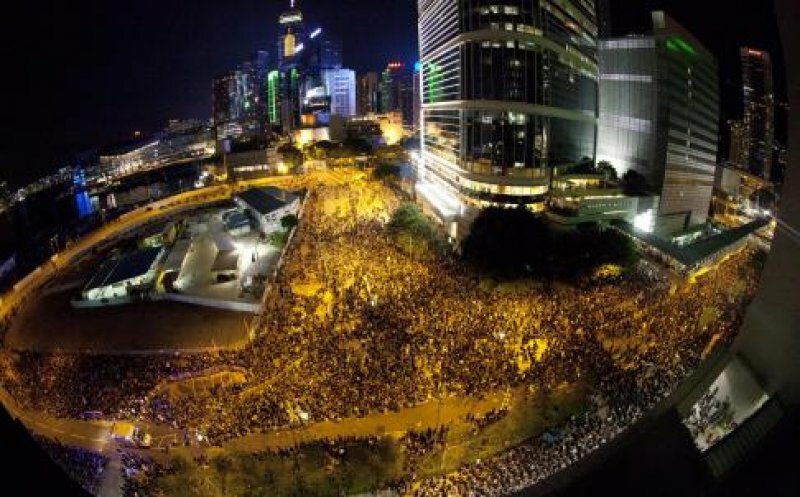 An avalanche of protesters poured into the area of ​​Admiralty (see photo), near the seat of government and Tamar barracks occupied by the garrison of soldiers of the liberation army from mainland China. According to the organizers, there were at least 120 thousand people, police say at 21.30 (local time), there were about 36 thousand demonstrators. But the flow of people was such that it invaded other neighborhoods close to Admiralty. Participants wore black T-shirts or black armbands, a sign of mourning for the freedom of education. The "national education" project consists of a number of hours that every class must dedicate to lessons in the history of China's great achievements, all thanks to the Communist Party in Beijing. Ample space must be given to the economic development of the motherland, but these lessons will not touch on topics such as human rights, the Tiananmen massacre, religious freedom or the controversial and violent history of the Chinese Communist Party. Card. Zen has always been an opponent to this "education", describing it as a form of "brainwashing." In addition to the Cardinal and Jimmy Lai, one of Hong Kong's leading figures in the democratic movement Martin Lee Chu-ming, was also present. Tens of thousands of demonstrators gathered around the 12 young students on a one day hunger strike in front of the seat of government. Students, parents, teachers, trade unionists, politicians and even business owners are opposed to the inclusion of these hours of false "patriotism." The government does not seem to want to back down from its decision, but has invited a delegation of students and parents to participate in discussions with officials on the implementation of the program. However students and teachers are willing to boycott these lessons in forced "patriotism". One school in Sha Tin, that had decided to start the courses of "national education" after last night's event, decided to cancel them. The campaign is also growing in other parts of the world, thanks to immigrants from Hong Kong. A group in London has decided to a rally today outside the Territory's representative offices in the British capital. Previously, Card. Zen had told AsiaNews that Beijing fears the free education that is widespread in Hong Kong and has made control over schools one of the priorities of its project for the former British colony. This project is also part of the launch of an organizing committee in every school, that will be controlled by the government and remove replace the educational institutions that manage the schools, including the Catholic Church.